Planned giving can be a gift of stock, real estate, life insurance, cash or a bequest in a will. While there are many types of planned giving, wills and bequests are generally the most common. While outright gifts of cash are critical to St. Andrew’s success in reaching current school objectives, we are also committed to securing our future through these mechanisms. Click here to download the bequest instructions. 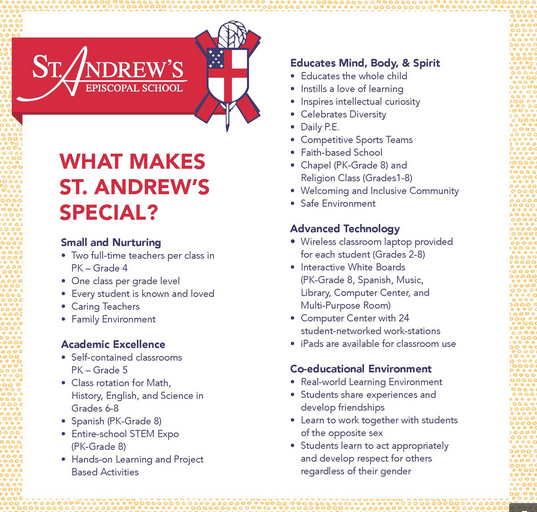 To learn more about making a Planned Gift, please contact Dominique Chauvin, Director of Development at (504) 866-6552 or dchauvin@standrewsepiscopalschool.org.